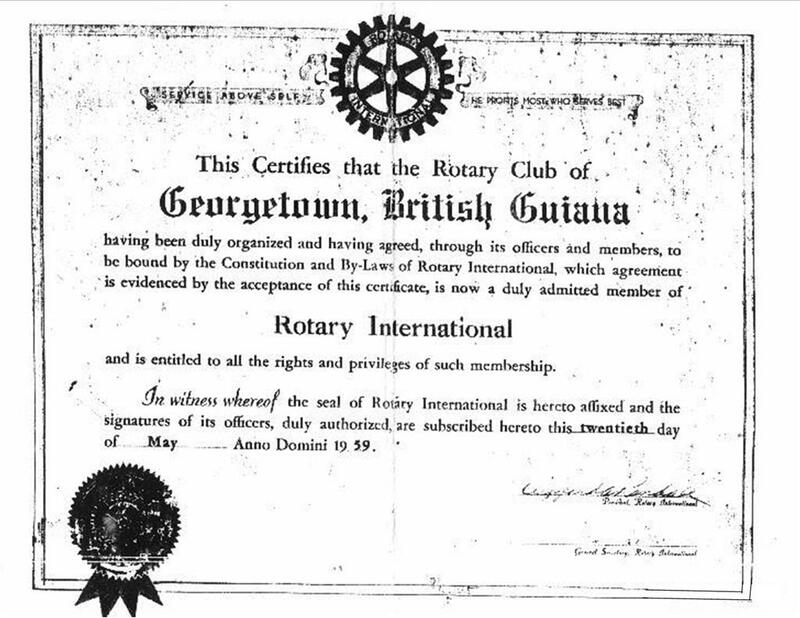 The Rotary Club of Georgetown Guyana was first constituted on May 20, 1959. Dr B.B.G Nehaul the then Government Pathologist and Bacteriologist of British Guiana, who conceived the idea of establishing a service club in Guyana, chose the Rotary. His efforts at forming a club were unrelenting and spread over two years. Dr Nehaul visited the headquarters of Rotary International in Evanston, Chicago on several occasions, at his expense and returned home to interview persons, whom he identified, as selfless and community-service oriented, as well as prominent in their professional or business pursuits. According to the Constitution of Rotary, Dr Nehaul needed men who satisfied the Classification Rule: that they were in separate and distinct businesses and professional services rendered to the community: That, basically, their job descriptions “most accurately described the principal and recognized activities”, of their organizations or undertakings. Eighteen such persons were identified, and in July 1958 they constituted a Provisional Rotary Club. That meant that their formal application for membership had been received and acknowledged by the secretariat of Rotary International, pending their formal admission, on the 20th May 1959.